A MAJOR city centre regeneration scheme could be scaled down or altered due to difficulties attracting a major flagship store. 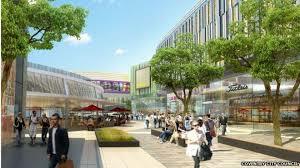 The City Centre South scheme is central to the council’s long-held ambitions to transform the city centre into the ‘second biggest-shopping destination in the West Midlands’. But the council is still searching for an ‘anchor’ tenant years after it announced the scheme – which could cost more than £200million. John Lewis and other department stores have been mooted over the years. The anchor tenant is intended to attract other stores to the area. A meeting of the council’s audit and procurement committee discussed the project yesterday (January 21). A corporate risk report states: “The failure to acquire an ‘aspirational’ anchor store will have a direct impact on the development and ‘prestige’ of the area. The report states discussions to identify an anchor store are on-going but alternative plans are being prepared if one is not identified. The council will also need to seek planning permission for the scheme once again, as it is ‘no longer current’. To add to concerns, the council also needs to acquire the remaining land and property on the proposed site to complete the scheme. The report states: “It is important that there is timely acquisition of land and property to enable the scheme to proceed as planned so the expected outputs are delivered. The city centre’s retail performance has been sluggish and inconsistent, despite Coventry being one of the UK’s biggest cities. These woes have been confounded by the difficulties suffered by many major retailers on the nation’s high streets. The scheme around Bull Yard, Shelton Square, City Arcade and Hertford Street also includes plans for hotel and leisure.